Right now this Carry-All Mom Backpack | Diaper Bag is $34.99 (Retail $62.99). Introducing Sweet Lemon Carry-all Backpacks! 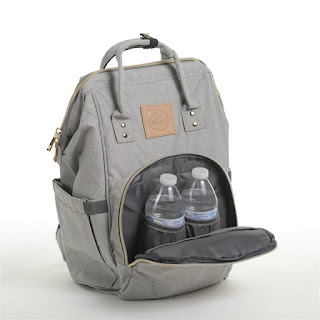 We have designed a high functioning, backpack that can be used for a Diaper bag or an everyday carry-all backpack. Moms love this backpack to be used for a Diaper Bag and the colors are perfect for Dad to carry too! Beautiful for her and not too feminine that Dad won't carry it. This bag is a perfect bag for students or anyone on the go. The insulted pocket in front if perfect for water bottles or baby bottles / sippy cups and have tons of storage. Front pouch is insulated to carry your water bottle and baby's bottles. Back top zipper gives you easy access to your cell phone and keys. Side pouch has an insert for wipes or tissues with an opening for easy access. Back zipper opens into the bottom of the bag for easy access. Strong padded, fully adjustable straps on back for comfort while carrying. Easy wipe out liner inside. Metal clip inside great for baby pacifier or your keys. 16" X 12.5" X 6.5"